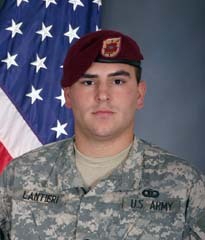 Sgt Jason M. Lantieri (1982-2007) « Jason Lantieri Memorial Foundation, Inc.
Sgt. Jason Lantieri of Killingworth, Connecticut graduated from Haddam-Killingworth High School in 2000 and graduated from Western New England College in 2004 with a bachelor’s degree in general business. He was a member of the college’s men’s soccer team. Jason enlisted in the Army in 2005, and he was sent to Iraq in 2006 and was due home in December for a break. He was promoted to sergeant while in Iraq, and Jason was due to come home in December 2007. Jason’s vivid spirit and mischievous nature left their mark. Here’s one story told by Jason’s best friend, Steve Haeckel. One day, playing golf with friends, Jason belly-flopped into a pond on the fairway of the eighteenth hole as a thunderstorm approached. “We’re going to get wet anyway,” Jason said. There was almost nothing Jason wouldn’t try, and there was no dare Jason wouldn’t take. Jason’s contagious smile and his permanent optimism pulled him out of plenty of scrapes. Throughout his short life, Jason always dreamed big and lived life to the fullest. Jason was an avid fan of many sports, but waffle ball had a special place in his heart. His waffle ball bats, customized with electrical tape and all sorts of geegaws, were a perfect example of Jason’s tinkering. He always had a good idea how to make things better, faster, and stronger. He was also supposed to come home over the summer, but his unit’s deployment was extended. He worked a couple of jobs before joining the Army. His mother believes he enlisted because he was looking for adventure and wanted to see the world. Jason was on active duty and in the Army Airborne Division when he was killed at age 25.